Based on Nicholas Sparks' best-selling novel, THE NOTEBOOK tells the achingly tender story of two young lovers whose passion is put to the test. Allie, elderly and ravaged by Alzheimer's, lives alone in a nursing home, the memory of her passionate youth all but lost. Duke, a fellow patient, reads to Allie the story of her life from her own tattered notebook. She and Noah fell in love in the 1940's, but her parents tore them apart. Years later, when fate brought them back together, she had to make a choice between her first love and a man she was betrothed to marry. Who did she choose? As the story unfolds, it is clear that Duke is more than a patient, and in her rare moments of clarity, Allie can see...Noah. Spanning six decades, this visually and emotionally sweeping romantic saga is a testament to the enduring power of love. The cinematography by Robert Fraisse ("Seven Years in Tibet") is simply beautiful. Sunset, a simple boat ride down the river is amazingly captured with the right mood and angles. South Carolina where the movie is filmed is scenically shot. Although "The Notebook" doesn't boast a well-known cast, everyone including the leads and supporting members did a great job. Joan Allen's performance as McAdams' mum is astounding. 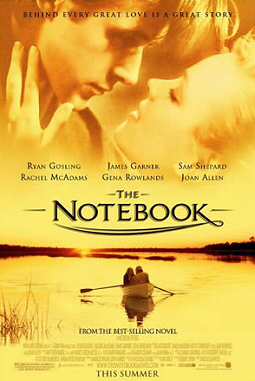 "The Notebook" is a tale of undying love and passion. It's pace is slow, full of clichés. Nevertheless, there are parts where tears are shed and sniffing can be heard. No men can live without memories which is why we used videocams, cameras and in this case a notebook to jot, take down every details and I don't think memories will be the same if Love does not constitute a part. In conclusion, this movie is not just for romantic diehards but recommended to audience who simply desire a story of undying love and sacrifices. Publicity Stills of "The Notebook"